The beautiful Elgin Valley is a high inland plateau, surrounded by mountains, just 70km from Cape Town. This is the home of Elgin Vintners. Our single biggest advantage is the biodiversity of our vineyards, with an unrivalled spectrum of terroir, soils, aspects, altitudes and meso-climates. The Elgin region is high altitude with the South-Easterly wind bringing a cooling respite to the vineyards. It is the blending of these essential elements that contributes to the fine quality of the award-winning wines produced. There are 6 growers producing grapes for Elgin Vintners. Our wines are crafted at 3 different cellars suited for specific cultivars. Our Pinot Noir 2012 won an International Decanter Trophy for the best Pinot Noir in the world for under 15 Pounds. 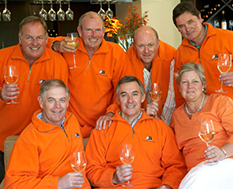 Elgin Vintners is the 4th oldest winery in Elgin and has some of the oldest vines planted in the region. A partnership of six different families in Elgin. The expertise of the 3 cellars are used for the specific cultivars.